Designed for the air intake and extract systems of critical applications such as Pharmaceutical and Electronic manufacturing and in Hospital and research laboratories where high efficiency filtration is necessary.They are also used in Safe Change systems. 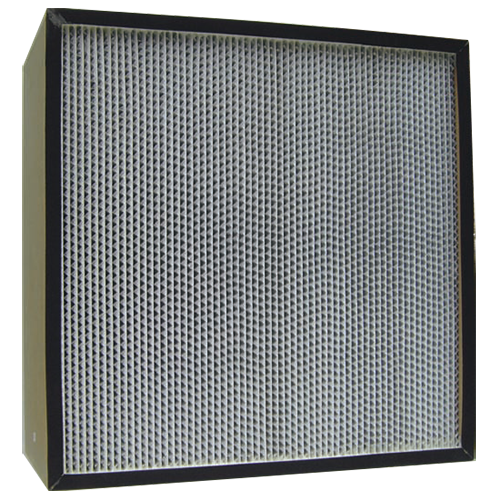 HEPA filters are normally used as final filters with pre filters fitted upstream to extend their life.These filters are subjected to full quality assurance procedures and each filter is individually leak tested, certified and numbered for tracking. Deep Pleat filters are designed to give the optimum combination of high filtration efficiency and excellent dust holding capacity. They consist of a deep pleat pack of filter media, sealed into either a corrosion resistant coated mild steel or MDF case.The filter pack is a continuous length of high efficiency water repellent micro-fibre glass filter media, folded over aluminium or kraft paper separators. It is then bonded to the case with a polyurethane sealant to give a rigid and robust construction. Deep Pleat HEPA�s are available with efficiencies between H10 and H14, in a range of standard cases with nominal airflow rates up to 3800m3/hr.